280 pages | 1 B/W Illus. Law mattered in later medieval England and Ireland. A quick glance at the sources suggests as much. From the charter to the will to the court roll, the majority of the documents which have survived from later medieval England and Ireland, and medieval Europe in general, are legal in nature. Yet despite the fact that law played a prominent role in medieval society, legal history has long been a marginal subject within medieval studies both in Britain and North America. Much good work has been done in this field, but there is much still to do. 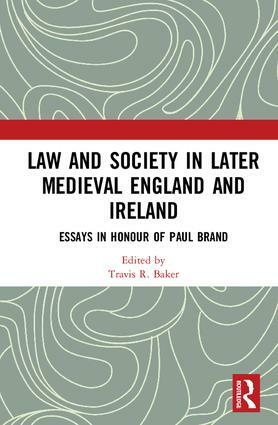 This volume, a collection of essays in honour of Paul Brand, who has contributed perhaps more than any other historian to our understanding of the legal developments of later medieval England and Ireland, is intended to help fill this gap. The essays collected in this volume, which range from the twelfth to the sixteenth century, offer the latest research on a variety of topics within this field of inquiry. While some consider familiar topics, they do so from new angles, whether by exploring the underlying assumptions behind England’s adoption of trial by jury for crime or by assessing the financial aspects of the General Eyre, a core institution of jurisdiction in twelfth- and thirteenth-century England. Most, however, consider topics which have received little attention from scholars, from the significance of judges and lawyers smiling and laughing in the courtroom to the profits and perils of judicial office in English Ireland. The essays provide new insights into how the law developed and functioned within the legal profession and courtroom in late medieval England and Ireland, as well as how it pervaded the society at large. Travis R. Baker is a private scholar living in San Diego, California.